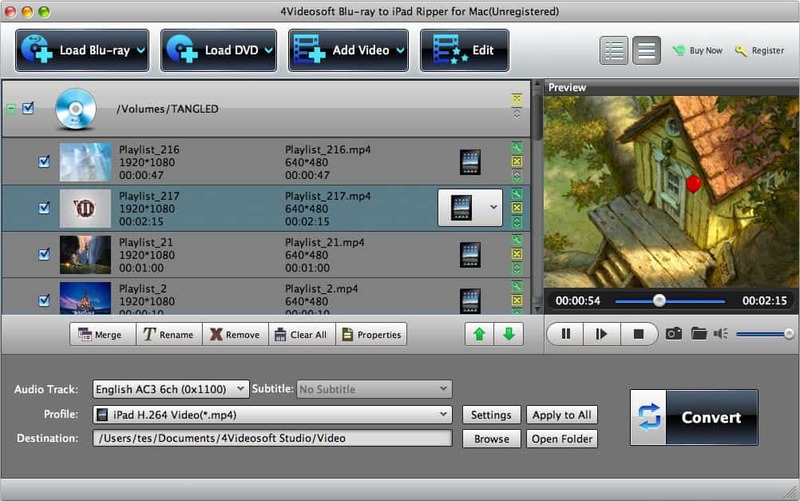 4Videosoft Mac Blu-ray to iPad Ripper 5.1.26 Free Download - Convert BD/DVD/video to iPad MOV/M4V/MP4 on Mac freely. Convert BD/DVD/video to iPad MOV/M4V/MP4 on Mac freely. 4Videosoft Blu-ray to iPad Ripper for Mac can help Mac users a lot. With it, you can convert Blu-ray movies, DVD movies and general videos to iPad MP4, M4V and MOV. You can optimize the output video with the versatile editing functions as you like. The Blu-ray to iPad Ripper for Mac is professional Video Converter for you. It can convert Blu-ray movies and DVD movies to popular iPad videos. And you can convert the normal videos to iPad MP4, MOV and M4V without limitation. It highly supports almost all popular video formats like MTS, MXF, AVI, FLV, WMV, MKV, etc. You can add them to the program and convert them to the video formats as you like. In addition, you are able to extract the audio file from the source video and convert them to popular iPad audio formats. The powerful Blu-ray to iPad Ripper for Mac provides you with versatile editing functions to edit the output videos as you like. You can modify the output video effect by adjusting brightness, contrast, saturation, hue and volume. It allows you to reset the video length and screen size as well as add your favorite text and image watermark. You can merge two or more videos into one for convenient enjoyment. 4Videosoft Blu-ray to iPad Ripper for Mac enables you to preview the original video and capture the pictures of your favorite moment. This wonderful software highly supports almost all popular iOS devices so that you can enjoy the output videos on your iPhone 5S/5C, iPhone 5, iPad air, iPad mini 2, iPod touch and iPod nano and so on. Now it adopts new kernel and high improves the conversion quality and speed. Statement: First, please download the orginal installation package by clicking the download link. Of course you may also download it from the publisher's website. Using 4Videosoft Mac Blu-ray to iPad Ripper crack, key, patch, serial number, registration code, keygen is illegal. The download file hosted at publisher website. We do not provide any download link points to Rapidshare, Hotfile, Depositfiles, Mediafire, Filefactory, etc. or obtained from file sharing programs such as Limewire, Kazaa, Imesh, Ares, BearShare, BitTorrent, WinMX etc. Software piracy is theft. If you like 4Videosoft Mac Blu-ray to iPad Ripper please buy it.